What is a "position?" 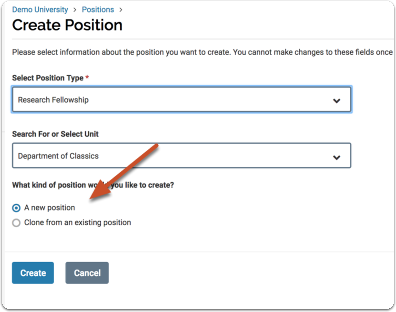 In Interfolio Faculty Search, the term "position" refers to a faculty, staff or fellowship opportunity. The position is the object of the search. So, what is a "search?" 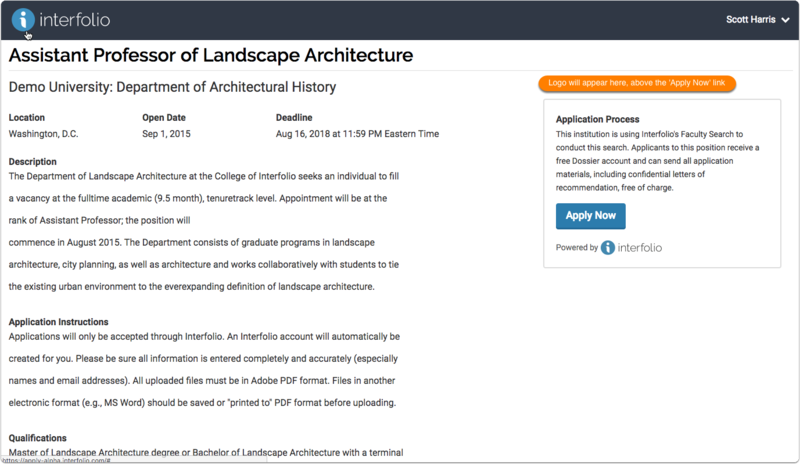 You can think of a search in Interfolio Faculty Search as an academic, staff or fellowship position that gathers together application materials to be evaluated by a committee. A search is a single place to collect, store, view, and review applicant materials. 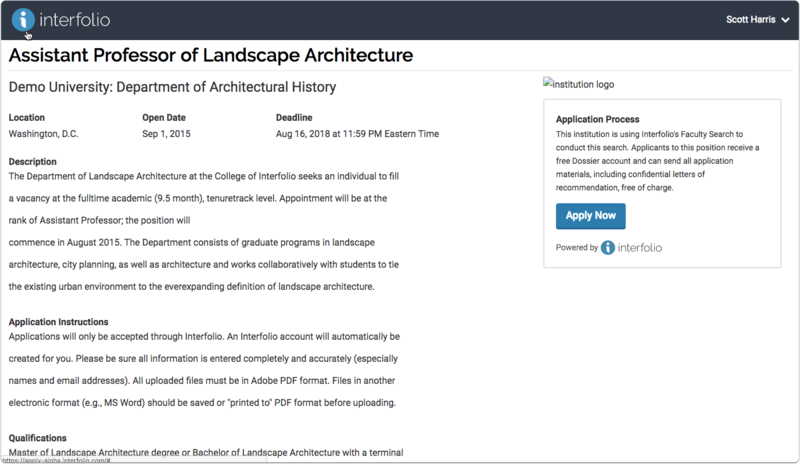 Creating a search is a guided step-by-step process that involves adding information about your search and instructions for applicants, creating a set of requirements for your position, appointing a search committee, and creating a landing page with a unique URL that will serve as the online application for your open position. It may be useful to familiarize yourself with the process from an applicant's point of view. See our Job Applicant's Guide to Interfolio Faculty Search for more information on the applicant experience of applying for a Faculty Search position. Positions can be created for any organizational unit in the program. For instance, a position can be created by the unit Demo University or by any lower organizational unit within that university, such as a school or department, or any unit within the school or department and so on. 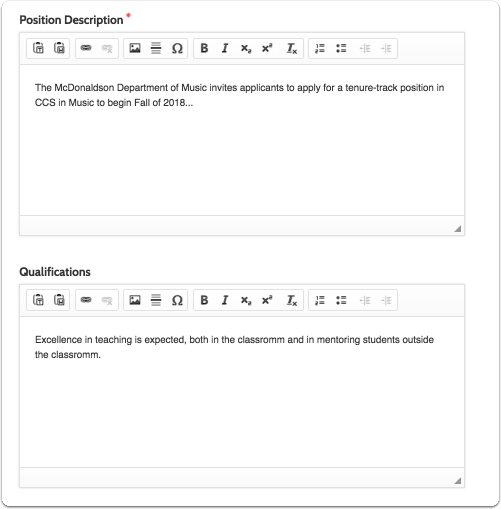 Administrators can add positions to any organizational unit at or below the unit they have been assigned to administer, and Committee Managers can create positions for any unit at or below the unit for which they have been assigned as a Committee Manager. When applications are no longer being considered, either because a hire was made or some other reason, Committee Managers, and Administrators can close a position and indicate which applicants were selected to fill the position. 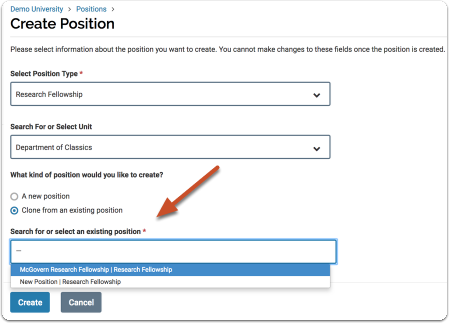 This article explains the steps involved in creating a position in Interfolio Faculty Search. Note: By creating a position you will also generate a landing page that applicants will use to learn about and apply for your position. 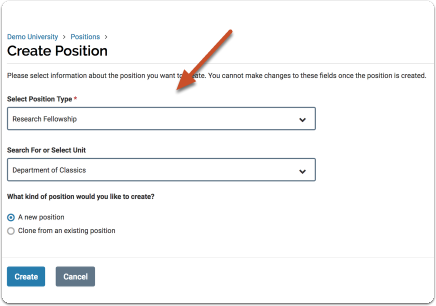 Zoom: Note: By creating a position you will also generate a landing page that applicants will use to learn about and apply for your position. Now you're ready to create your position! Position Opens: Date when new applications will first be accepted for the position. Describe the position in as much detail as possible, and list specific qualifications. 1.4. 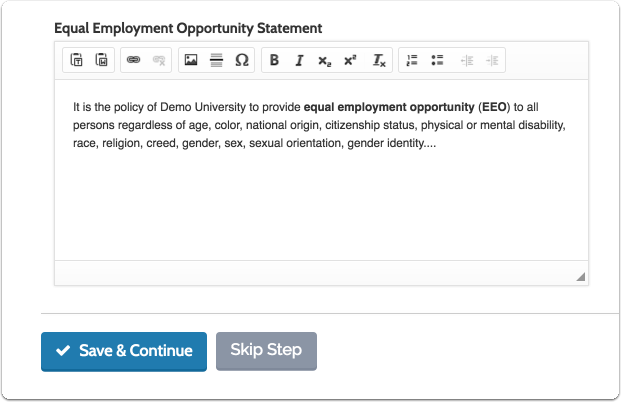 Enter an Equal Employment Opportunity Statement, and click "Save & Continue"
Note: Your institution may already have the EEO statement set up for you. 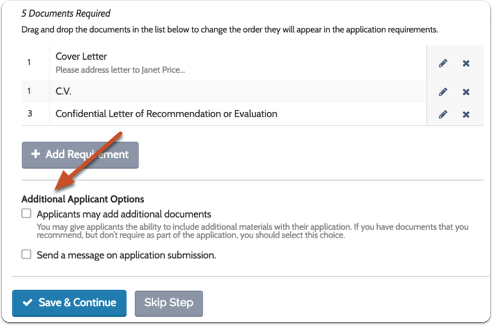 Here you can add the documents your applicants must submit with their application. 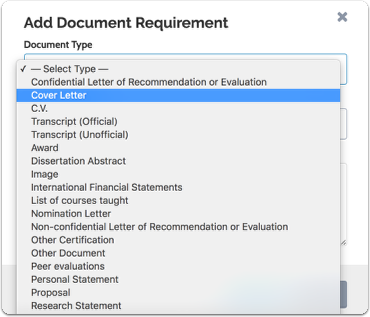 You can set the document type such as C.V., or Peer Evaluations, and set the number of documents necessary to fulfill the requirement. For instance, you might require one C.V. and three peer evaluations. 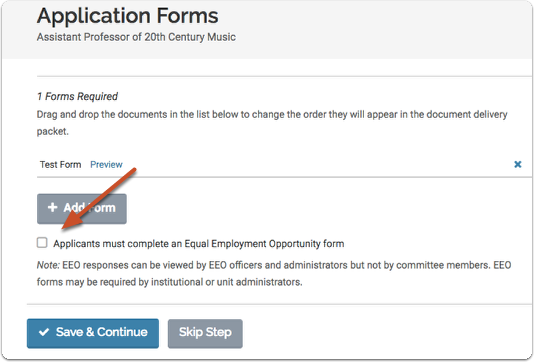 Your applicant can upload these documents and submit them electronically when applying for a Faculty Search position. 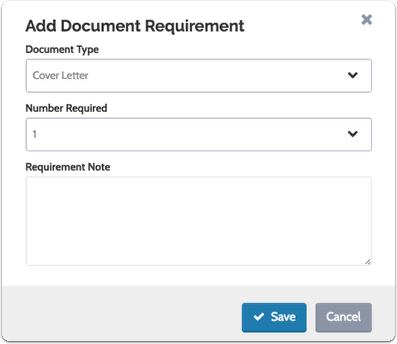 The applicant will need to upload the exact number of each document type that you set in order to fulfill the requirement. When a requirement is filled the check mark will turn green. If your institution allows, you can establish custom evaluation criteria for rating applicants on a 5-star scale. This allows Evaluators to rate and compare applicants on criteria such as scholarship, teaching, research, publishing, or whatever criteria you add. We will calculate the average score of an applicant by both category and overall rating. 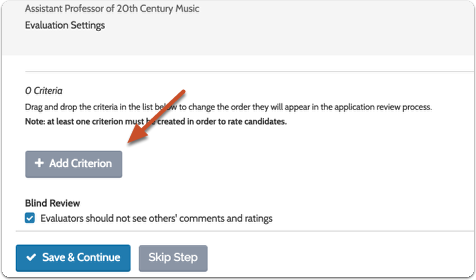 You can set whether or not Evaluators can view comments and ratings given by other users. 4.2. 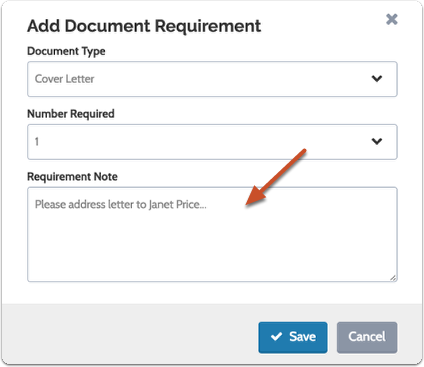 Type in the evaluation criterion and click "Save"
Note: Application forms are attached during the process of creating or editing a position, but forms are created from the Administration page. 5.2. 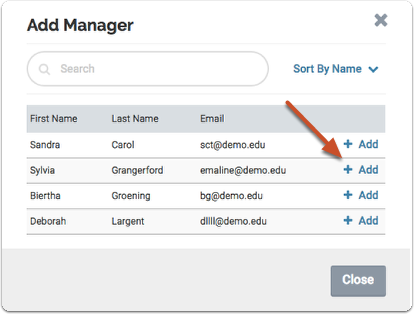 Select form from the dropdown list and click "Save"
A list of forms that have already been created (from the Administration page) will appear in the dropdown list. 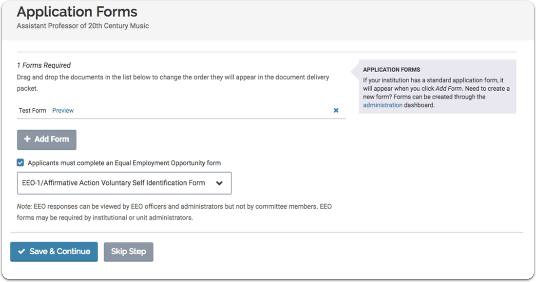 Note: EEO forms are attached during the process of creating or editing a position, but EEO forms are created from the Administration page. 6.1. Check the box labeled "Applicants must complete an Equal Employment Opportunity form." 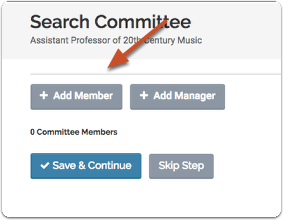 You have the option to add members to a search committee as part of the position creation process. 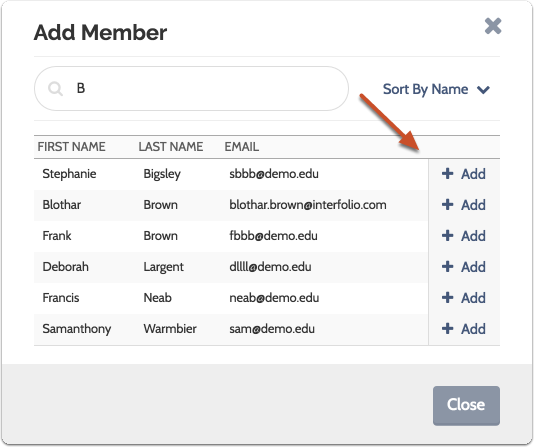 Note that in order to be assigned to a search, potential committee members must be added to the program as Interfolio faculty Search users. 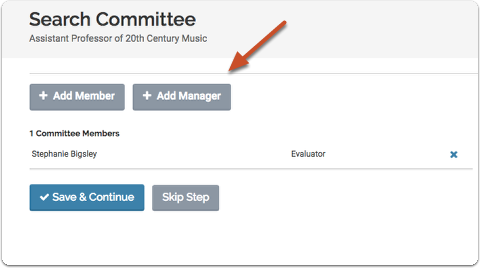 Note: You can also add committee members after a position is created from the Review Position screen. For more information, see How do I add members to a search committee? As you are typing, matches of existing Faculty Search users will appear. 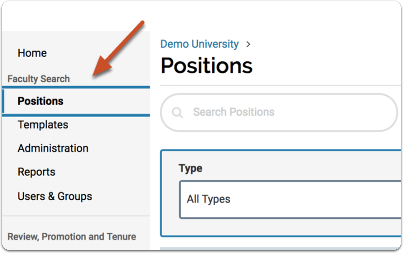 If you don't see the user you are looking for, you may need to add them as Faculty Search user. This list displays users who have been assigned the role of Committee Manager for the unit in which you are creating the position. 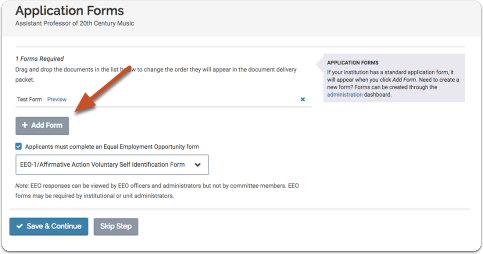 If you don't see the user you are looking for you may need to add them to the program as a ByCommittee user, or assign the user the role of Committee Manager for the unit in which you are creating the position. 7.5. 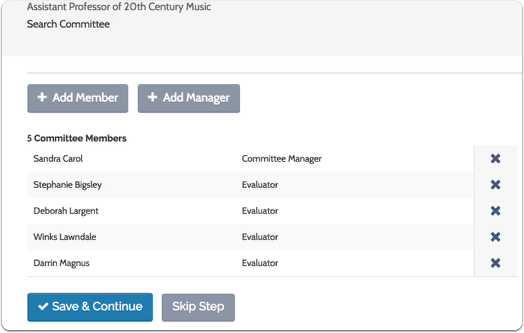 Keep adding members and/or managers until you have your committee assembled, and click "Save & Continue"
To remove a member, simply click the X next to the user's information. You will be taken to the "Internal Notes" page of the position. 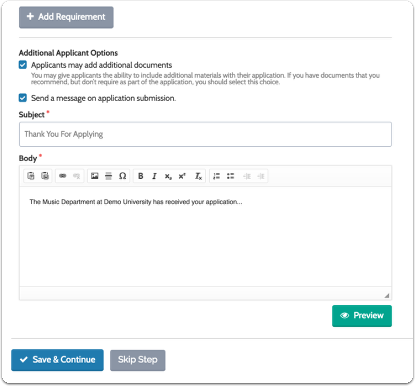 Internal notes are optional, are only accessible to users at your institution and will never be seen by applicants. They are available to all committee members for the position. 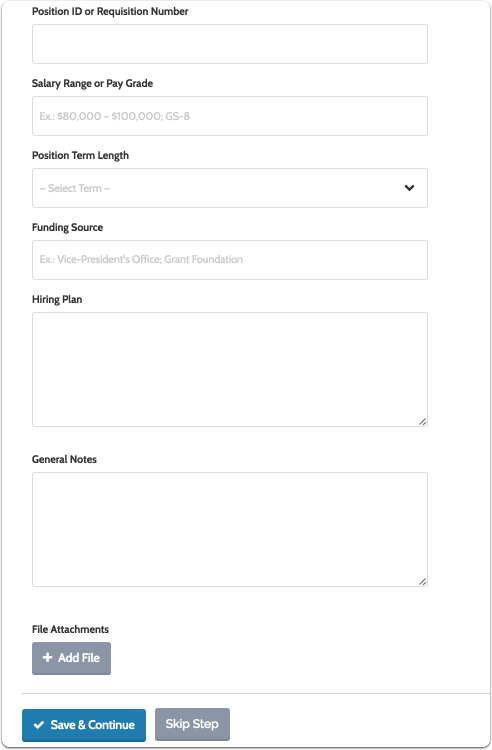 Here you can add a position ID number, enter a salary range, select a term length for the position you have created, identify the funding source, writer out a hiring plan, add general notes, and upload files that will become available for committee members evaluating the position. If approval is required, click "Submit for Approval." 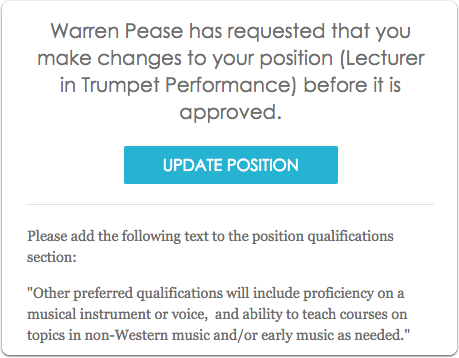 An email will be sent to the administrator responsible for approving the position and he or she will be notified that your position requires approval when they log into the program. You may continue making edits and preparing the position while awaiting approval. 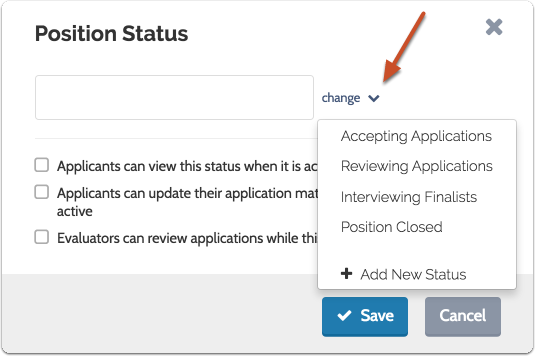 You will receive a notification once your position is approved or if changes need to be made to the position. 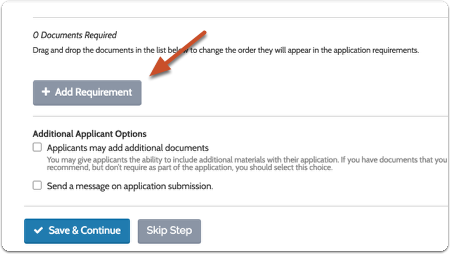 Your position will automatically be published when the Open date passes -or- you can click "change" to publish the "Apply Now" page manually. You will need to set an initial status for the position (such as "Accepting Applications"). 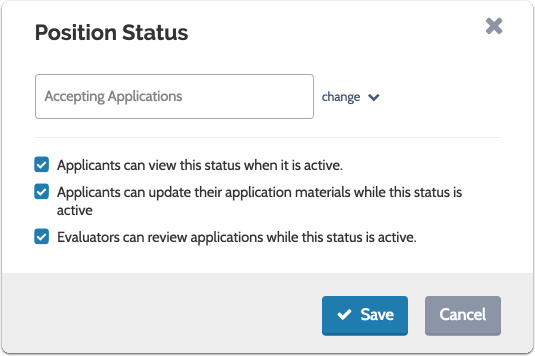 Set whether or not applicants can view or update their materials, and whether or not evaluators can review applications when the status is active. When the open date passes your "Apply Now" page will automatically be published, but you can click "change" to publish it manually. The URL of your position will display on the review page. You can use this URL wherever you want to announce your position. 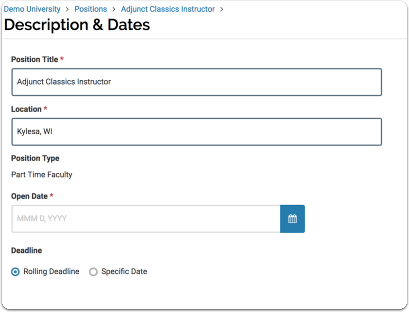 After you create a position and the position has passed it's open date, or you have manually published the URL, Faculty Search generates a landing page announcing the position. The landing page includes details and application instructions. It also provides applicants with a free Interfolio Dossier account, which they use to apply for your position.